There are many who live in farm communities throughout the Midwest and the South who have witnessed a rather unusual sight: rolling right into their town, a mobile greenhouse that is a living example of sustainable farming. 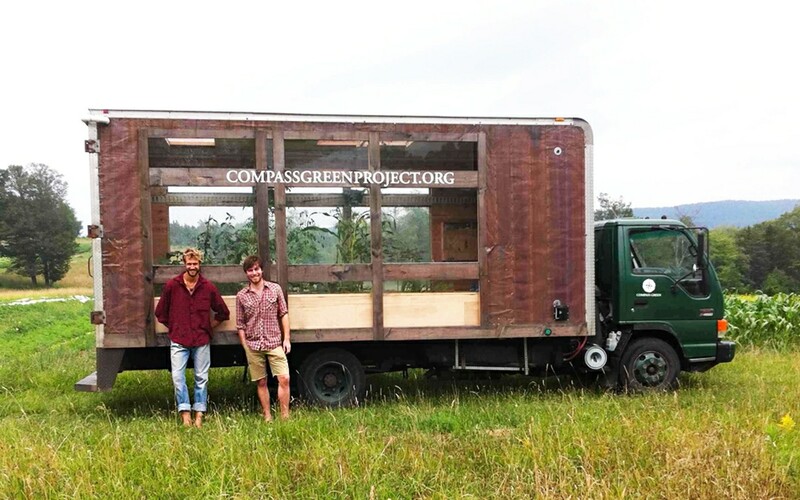 The truck, operated by a project called Compass Green, has left in its wake, all around the country, some 3,000 students trained in sustainable and organic farming. Biointensive farming, which makes up the Compass Green curriculum, delivers an average of four to six times the production value of the US average yield. These methods can be applied in the city, in a backyard, or on a plot of land. “Regardless of people’s situations, we tell them, `If we can do it in the back of a truck, you can do it in your own home,’” Cutter said. For schools, Cutter and his team spend part of the time in a classroom and part of the time performing demonstrations on the truck. In that many of the areas Cutter is teaching in are strongholds of industrial agriculture, he doesn’t polarize people. “There have been some farmers that have come to our workshop who are interested in transitioning to more organic methods, and that’s been really cool,” he said. “The farmers are not the enemy. I’ve gone into schools in Iowa, and all the kids know about agriculture. Many of the students actually have family involved in farming; so I couldn’t look in their faces and say, ‘Oh, these farmers are doing terrible things,’ because they’re not. They’ve come from generations of farming and they really want to feed people in the best way they know how. Cutter is certainly no stranger to interesting enterprises. At age 27 he has already lived as a monk in India, was employed on a schooner in Hawaii, and has worked closely with John Jeavons, a founding father of sustainable agriculture. By the time he began his professional life, organic and sustainable agriculture was already in his blood. “I got interested in organic food early on,” Cutter related. “I was lucky to have parents who felt it was important to eat healthy and organically. A few years later I discovered the growing side of things—I was living on a sailboat in Hawaii and used to come on shore once a week. I did a whole lot of wild harvesting of different plants that are native to Hawaii: breadfruit, coconuts, bananas, avocados and some of the vegetables they grow in the jungle. I also worked on an organic farm there one day a week to get the vegetables that I needed for that week. To learn more about Compass Green, visit www.compassgreenproject.org.